If you’ve always loved travel you may be thinking, “Can you travel with a baby?” Just because you have a new baby it doesn’t mean that you have to be stuck at home. Traveling with toddlers may seem like a daunting task. But it doesn’t have to be. All you need is a little preparation, insider knowledge and patience. By knowing the best places to travel with a baby in the world; you can select the best baby-friendly countries to visit to ensure that your trip will run as smoothly as possible. After one of the most affordable places to visit with a baby in Asia? For one of the best holidays with a baby or even older kids, head to beautiful Iran. 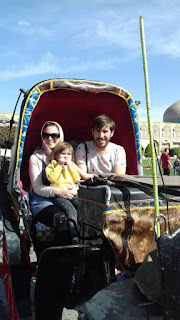 Iran is one of the best places to go on holiday with a baby and it is really easy to find some beautiful family-friendly accommodation options. Originally from England, Claire is a wife and a mother to this cute girl. Together with her family, she is embarking on a journey to focus on her dreams and her passion for travel. Reza, our well-informed driver-guide, accompanied this adventurous family to chase their own dreams!